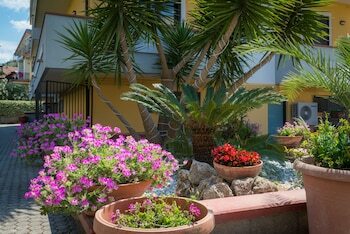 Located in Agropoli, Bed and Breakfast Marlè is in a national park, a 5-minute drive from Agropoli Castle and 9 minutes from Port of Agropoli. Featured amenities include luggage storage and a library. A roundtrip airport shuttle is provided for a surcharge (available on request), and free self parking is available onsite. Located in Bertinoro, Romagna is in the suburbs, within a 15-minute drive of Casa dei Ricordi and Sanctuary of Santa Maria Delle Grazie. Free self parking is available onsite. Located in Rome (Vatican), Belli36 Rooms is within a 15-minute walk of Piazza del Popolo and Castel Sant'Angelo. Featured amenities include an elevator (lift) and coffee/tea in a common area.